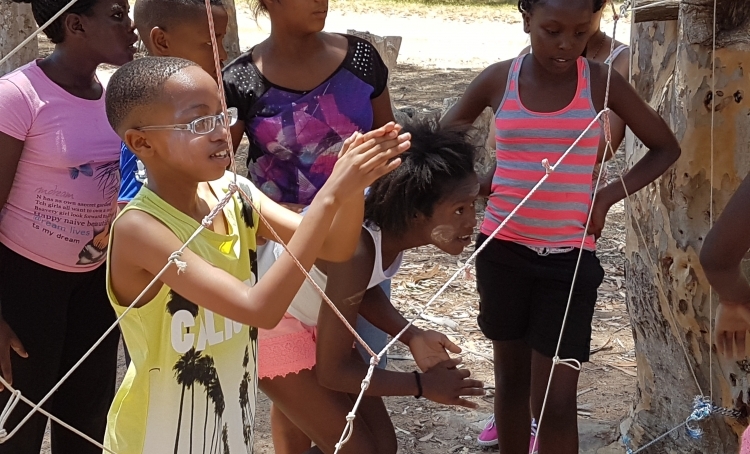 Seventh grade learners at Christel House South Africa discovered that learning to walk while wearing a blindfold or relying on their fellow students to help them cross a rope bridge can be a lesson in trust. Those are just some of the many physical activities the students participated in at a leadership camp in Stellenbosch, about a 40 minute drive from Christel House. The physical tasks challenge the students to learn about themselves, giving them a chance to better understand their own personal strengths and weaknesses. The activities are organized to teach students how to support and trust each other – critical leadership skills they will use for life. Christel House teachers Chris Paulsen, Ashley Lenders, Daniel Herdien, Sindiswa Humani, Rene van Niekerk and Lynn Adams along with facilitators closely monitor and support the students through the fun activities. Besides creating life lessons for the learners, teachers also identify leaders for the Christel House South Africa student leadership program.